What impact do refugees have on the economy, and how best can they integrate into their new home? I explore these issues in my interview on CGTN. The recent executions in Saudi Arabia has sparked strong reactions in Iran and has the region in turmoil. Here are my thoughts regarding the impact of the Iran – Saudi Arabia tensions on global oil prices in an interview by CCTV America. The Middle East region centered on countries around Western Asia usually includes the following: Bahrain, Cyprus, Egypt, Iran, Iraq, Israel, Jordan, Kuwait, Lebanon, Oman, Palestine, Qatar, Saudi Arabia, Syria, Turkey, United Arab Emirates, and Yemen. Most of these countries, especially those that border the Persian Gulf, have vast reserves of crude oil and benefit greatly from petroleum exports. The region is a strategically, economically, politically, culturally, and religiously sensitive area that comprises about 5% of the world’s population or 371 million people. The region is also experiencing major security challenges and is adjusting to the recent oil price drop. As such, growth is expected to average 2.2 percent in 2015. This however has not deterred big brands like Apple and Netflix which are beginning to take notice of the region and have begun expanding there. Apple is opening its first two stores – in Dubai and Abu Dhabi. The store in Dubai’s Mall of Emirates is said to be the largest to be ever built. Previously, shoppers of Apple products had to purchase their products through resellers or when on holiday abroad. The company has been growing fast in the Middle East in the past few years. Sales of iPhones were up 50% year on year in the third quarter last year and Apple’s revenue in emerging markets was up 58% in April. It is also planning to expand to Saudi Arabia. Netflix is another company that is planning to expand in the region. Joris Evers, vice president and head of communications for Europe, Middle East, and Africa confirmed their plans as part of their global expansion by 2016. Netflix currently has 69 million subscribers in more than 50 countries worldwide – 43 million of which are in the U.S. It is aggressively stepping up its global efforts with recent international launches in Spain and Italy. The company is expected to grow by 22% by 2019, gaining 10 million new subscribers in the U.S., 10 million in Europe, and the rest in other international markets. In April, the Starz network actually launched its Starz Play Arabia across 17 territories in the Middle East and North Africa, making the first-Starz expansion outside the U.S.
Other big brands are also looking into the region such as UK-based cosmetics company Lush which plans to open 50 stores over the next three years. Uber has also been said to invest $250 million to expand in the Middle East and North Africa, which are some of ride-sharing’s fastest growing markets. The Global Competitiveness Report that is published by the World Economic Forum looks at the competitive landscape of 144 economies in terms of the institutions, policies, and factors that determine the productivity and long-term growth of a country. Sectors such as a country’s infrastructure, macroeconomic environment, health, education, job market, financial development, and technological readiness are all considered. Switzerland and Singapore retain their position as first and second respectively. The United States moves to third from fifth place last year. Those countries in Europe such as Spain, Portugal, and Greece are effectively implementing reforms and remain highly competitive. Whereas, the other half of Europe is lagging behind including France and Italy. Most improved region belongs to Southeast Asia where Malaysia (20th), Thailand (31st), Indonesia (34th), Philippines and Vietnam (68th) have all progressed in their rankings. The Philippines is the most improved economy since 2010 jumping from 85 to 52. 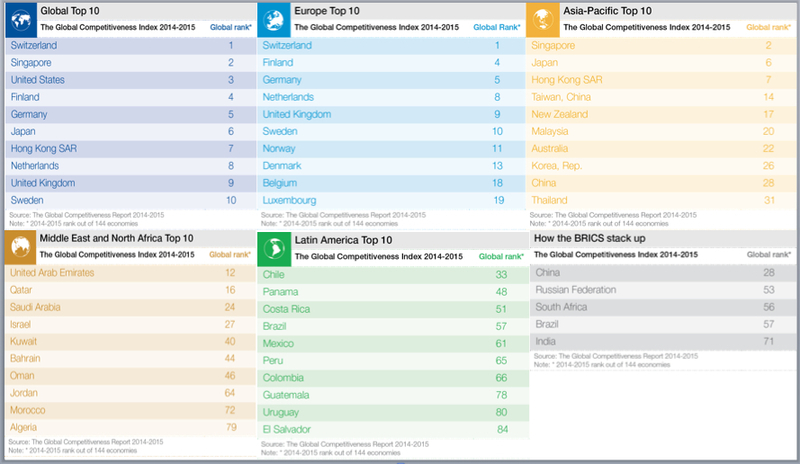 Emerging market economies such as Brazil (from 57 to 56) and India (from 60 to 71) lost their competitiveness. But Russia (from 64 to 53) and China (from 29 to 28) climbed in global rankings. Most Latin American economies need to address their productivity challenges in order to keep the momentum of their growth in the past years. Due to geopolitical instability in the Middle East and North Africa, the region depicts a mixed picture. United Arab Emirates takes the lead in 12th place. Sub-Saharan Africa continues to pose impressive growth rates of 5 percent. Are the rankings useful to you? Any surprises? Tell us what you think.